Campfires: Only in Fire Fields 5 and 6. Big fire pits. Wood: Large piles of wood of all sorts left at the entrance to the fire fields, including pallets, tree stumps, old doors etc. Bring an axe. 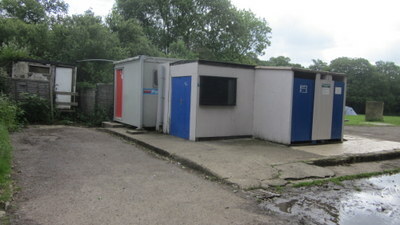 Facilities: Two toilet blocks, one with showers. The review: ‘Why are you trekking all the way over there?’, was the general cry when I disclosed the location of last weekend’s camping trip to my local friends. I live in Bath, with excellent access to much of the South West and Wales, so why trek across the country to the outer limits of London to camp? Well, to be honest if it were entirely in my hands I probably wouldn’t , but I did, twice in fact, we went last year too. And why? To meet up with friends from London of course! Last time, as we arrived we had problems with a rather scary large family who had pitched on our pitch (which had been booked for about 6 months) who were absolutely NOT moving. To be fair I understood their position, they had been told to camp anywhere so they did. Sadly they didn’t understand our position, quite loudly. It did not make a great start to that visit. Anyway as we arrived this time after a VERY long and complicated journey I was just hoping there would be no scary confrontations to deal with before we could set up. And my wish was granted. But, what is the saying? ‘Be careful what you wish for’. There was very little chance of anyone nicking our pitch because it was on the side of a mountain. Ok, I am slightly overstating the geography, but the pitch was properly slopey. We found a part sort of flattish bit, only not really, we had to get the kids to switch sides in bed so big one wouldn’t squash little one and add extra height to the head end of our bed. The main problem was that we were expecting four or so tents to turn up the next day and there was no hope for them finding anywhere remotely flat to pitch. I spoke to the lady in reception the next day and she advised me that we could choose anywhere in field 6 as an alternative. Turned out that field 6 was pretty slopey too and when our friends turned up they trembled slightly at the thought of camping in the ‘party field’. Indeed, the next evening 3 police cars turned up in field 6 to deal with – well, whatever you need 3 police cars to sort out! Fortunately, following a further call to reception we were allowed a fabulously flat pitch in the corner of Field 5. All move. Much better. Apart from the bog. But I can’t really blame that on the campsite, there has been a phenomenal amount of rain recently! There are two very important things to know about Debden House. Number 1, it is huge. Really mind bogglingly enormous. Just to give you some sense of scale, there was a VW fest going on in one field and I ‘m not even sure where it was. 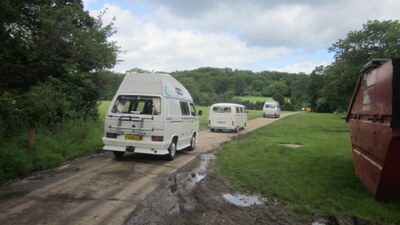 Three vans off to a VW fest – somewhere in the site! There are 7 fields in all, each one in itself the size of a pretty big campsite. And it isn’t just the campsite that is huge, it’s the piches too. 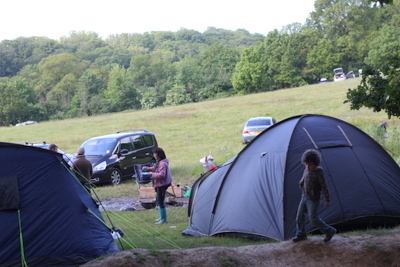 On our pitch we had 5 medium sized tents, 2 two man tents and a campervan. In ONE pitch! And because the field is so huge it is perfectly acceptable to spread into the middle a bit too so you can really have a great group camp. Now, given its enormousness you might imagine an abundance of facilities. You would imagine wrong. There are two toilet areas, see the blue spots on the map. The one in the middle is not wonderful. The toilet roll runs out in the evening, and I did find myself thinking of composting toilets with unexpected longing. My main gripe is the long hike to get there. I quite like the walking to the toilets thing when you are camping, but it really is a long way. As a result, lots of people use the woods immediately behind their pitch. Again, weeing in the woods is a fine by me , but leaving bits of loo paper hanging off the bushes is not fine. If you need a bit more luxury the toilet and shower block near the entrance is very well appointed, although an even longer trek from the ‘Fire Fields’. 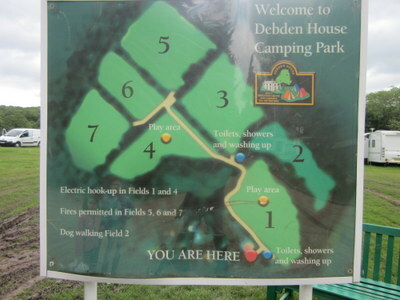 The second really important thing about Debden House is its location. Right in the middle of Epping Forest. I confess I had previously harboured the notion that Epping Forest was a bit like Forest Gate, where all that is left of the forest is the name. I was wrong. Epping Forest is large and magnificent. It is home to an abundance of wildlife, scores of ponds and lakes, mature oaks, beeches, hornbeam. Truly beautiful. Great for nature lovers, cyclists, walkers and rope swing lovers! It is an incredible place for Londoners to have relatively easy access to. The great thing about Debden House is that it is all right behind your pitch. Once you get beyond the tide mark of litter at the very edges you are straight into proper forest. There are rope swings dotted around and endless opportunities for den making, wildlife observing, tree climbing and general good clean fun. I am very torn about this site. There are some very good things about it. 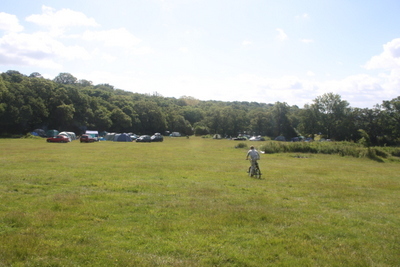 One of the fields is given over to institution camping, I mean brownies, youth groups, schools etc. A very heartening sight. Campfires are clearly a popular feature. The forest is amazing and the place is so enormous I doubt it would ever feel crowded. It is great for group camping, loads of space. However, the facilities are inadequate, people don’t take care, the staff don’t seem very engaged and there are definitely some problems with large groups of young people, although they do seem to have their own field. Oh and watch out for pitch 8 fire field 5, seriously its a mountainside. Also, it did seem rather expensive to me. 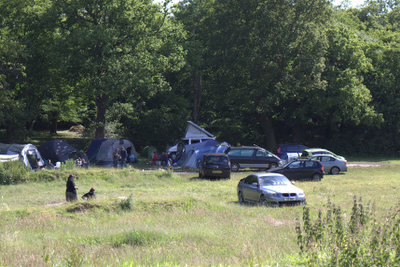 On site there is also a cycle hire facility www.gofurthercycling.co.uk , a little cafe and a campers shop. I didn’t use any of these so can’t really comment! In the end I guess it depends what you are after. I wouldn’t recommend trekking across the country for it- unless you have a bunch of friends from London who fancy doing a group camp. However, if you live in London and want a taste of forest and real camping, this is a good option. If you enjoy camping with a fire you might want to consider buying one of these. great review! you really must try Forgewood near Tunbridge Wells – a trek for you from Bath, but worth it for relaxed atmosphere and camp fires. Thanks, recipe junkie! I am going to the Eridge Estate (where Forgewood is I think?) for a festival in a few weeks. Can’t wait! Your blog is amazing! I love it! 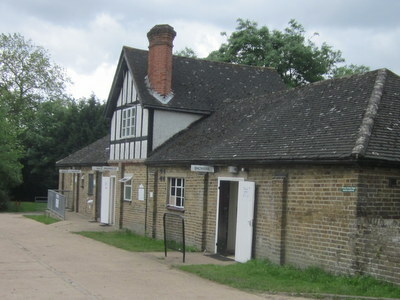 We have camped with a group in the Scout Hut at Epping. I’m going to reference your blog for every camping decision we make from now on! Aww thanks Lulastic, that is so nice to hear! Nice pitch! !… a loquacious and informative read. My son (Djed) and I were there last term and are returning on the 25 (to 28th Aug’) to ‘fire-field’ 6, pitch 229. Apart from masses of forest on the door step, Debden House acquire an inexhaustable supply of burning material (literally tons of palates, lintels, doors, architrave and all sorts ) from Newham Council…lorried in daily! and how pleasant to be lauded with the chirpy cheep of the dawn chorus supplied free by our feathered friends! Thanks Saxa. The left over building material is good isn’t it. Only you do have to be careful of nails! Thanks for letting us know. Prices seem rather steep now. Particularly the deposit for the fire pit! Although I know some campsites have problems with people walking off with fire pits. To be honest I was always a little uncomfortable with all the random building material left at the fire fields for burning. Kids climbing all over it, I saw someone step on a nail, possibly good old health and safety has kicked in! I wonder why the have changed the car access – possibly to do with all the rain, things had become rather boggy in some area when we were there. Anyway, thanks very much for letting us know about the changes! Last year the fee’s were reasonable but have noticed there’s a new pricing structure !, for some reason they seem to think its ok to charge you more if your a “non resident”??? ?, and that also goes for the hook up (confused). The organisation on the site last year and the year before was at best shambolic , litter bins full to brimming and not emptied for days , I used to use the laundry facilities on site until the washer broke! , I ask the manager when it was going to be repaired/replaced, “where waiting for an engineer”ok , one week later , what’s the latest on the laundry room “we’ve decided not bother repairing/replacing ad its too expensive, ??? ?, sorry , not good enough i’m afraid .The security on site were unaware that you could access the site through the woods from the back lane (I used to walk this way across the stream enroute to theydon bois tube station every day ) so what good are the security if they are not made aware of this ?!!!!!!. I may visit this again to see if there’s been any improvement but if they want to charge me more because i’m a non resident then I shall refuse and go elsewhere just on principle . Thanks for that Mark. It is such a shame this site isn’t better run. Epping Forest is really magnificent and this site ought to be a great opportunity for Londoners to enjoy it. Hi Guys and Gals I have camped here before as well and agree the facilities are very basic and given the numbers of pitches there are definitely not enough loos or showers!. the walk from the fire fields to the loos is a trek and the nearest ones hazard a health warning and yes they do use the woods as a toilet ! Not good if you are going there to enjoy nature and the beauty of Epping Forest, The café shuts early if it can’t cope and I wasn’t aware you can’t take your car to your pitch in the firefeilds now. Am looking to book for an event will have to call and inspect first I think now ! Thanks so much for your comment. If you are looking for an alternative campfire campsite not too far from London I would suggest Inwood or Abbotts Wood both near Basingstoke with good access to London. I read these reviews with interest. I stayed here for my first ever camping trip this summer (August 2013) so I don’t have anything to compare it too. I agree it was very pricey but it suited my needs. I stayed twice and each time on a different field. Field 2 is for dog owners (such as myself). It is near the main toilet block but the new set pitches are quite small. Luckily we spread over 2 and no-one complained. Fields 1 & 2 get very crowded though. Field 1 is for electric hook up. On our second visit we requested the fire field 6. Yes it was on a slope but we were the only people in the field so I let my dogs roam free. We trekked through the forest and enjoyed it. We hired the fire pit and got the deposit back without a hitch. I drove the car to the main block to do the washing up and use the shower as it’s too far to walk. I’d definitely go again as it’s only 20 mins from home and perfect for a 1-2 night short break. I did notice my mobile reception was iffy but for me that was a perk! Thanks for your comment. Always good to hear current experiences. My feeling about Debden is that it has a lot going of it and with a little tweaking could be truly great. In terms of a campsite so accessible for Londoners but also with a truly wild feel to it it doesn’t really have a comparison. Epping forest is epic! A brilliant campsite not unlike like a French camping municipal in terms of customer service and facilities. Absolutely massive but strictly controlled numbered pitches means no overcrowding. The field numbers can be used as a party rating; field one and two are nice and quiet, up to field seven (about a quarter of a mile away) which is often party central. Fires allowed everywhere except field one. Main toilet block is great, the outlying one leaves a bit to be desired. If you visit the city, the number 20 bus, 12min walk away, takes you to Walthamstow so you only need to pay for zone 3-1 travel and you’ve got the market as well as super cheap cafes, on the way there and back. It’s £8 per adult plus £3 for your car and you can drive to any pitch on site now. No need to hire a fire pit as all pitches have them.